Adds quest targets to each settler assigned to a supply line. Includes bat files to easily enable and disable tracking. Stay in radio contact with your supply caravans! 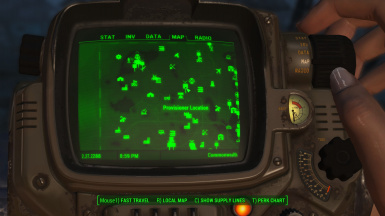 This mod adds a quest target to each settler you assign as a provisioner, so you can easily track them down. To show the psuedo-quest used for tracking provisioners, run the included ShowProvisioners batch file. Open the console with the ~ key, then type 'bat showprovisioners' without the quotes. If you get tired of the tracker clogging up your quest log, you can also run 'bat hideprovisioners' to hide it. This mod makes changes to the WorkshopParent quest, which contains a reference alias pointing to all existing provisioners. It will not be compatible with any mod which alters this quest.